I hope you caught at least the OT period in the IIHF World Championship game between Sweden and Canada from Cologne, Germany, on Sunday. The OT may have been the best hockey I have seen all of this season. There may not have been any goals, but there was a whole lot of action. It was hockey played the way it is meant to be played. It was wonderful. As for a tournament of such stature being decided by a shootout, let’s just say that in my mind Canada and Sweden shared the gold medal. Every year around this time, I mention a pet peeve of mine, and this year is no different: Some things shouldn’t have a price tag on them, and the Memorial Cup is one of them. 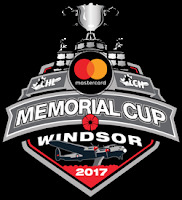 To have sold naming rights to the Memorial Cup is just wrong. In an interesting move, the Arizona Diamondbacks have come up with a promotion that allows fans to watch all 25 June and July home games for $50. By my math that’s $2 a game. Bench coach Rob Thomson managed the New York Yankees on Friday as they lost 5-4 to the host Tampa Bay Rays. Manager Joe Girardi was attending daughter Serena’s high school graduation. This was Thomson’s fourth stint as a fill-in manager with the Yankees. Thomson is from Sarnia, Ont., and is the first Canadian to manage an MLB game since George Gibson with the 1934 Pittsburgh Pirates. Gibson was from London, Ont. Can the Toronto Blue Jays ever be Canada’s team when they make themselves so easy to dislike? On the subject of the NBA, do you think the league has a problem with its competitive balance? Aside from Sunday’s victory by the Boston Celtics over the Cleveland Cavaliers, that is. F John Lammers (Lethbridge, Everett, 2001-06) has signed a one-year extension with Innsbruck (Austria, Erste Bank Liga). This season, in 55 games, he had 22 goals and 36 assists. He led his team in scoring and was fifth in the league scoring race. . . .
F Robin Soudek (Edmonton, Chilliwack/Victoria, 2008-12) has signed a one-year extension with Epinal (France, Ligue Magnus). This season, he had 19 goals and 12 assists in 43 games. He led Epinal in goals and was second on the team in points. . . .
F Michal Poletín (Regina, 2009-10) has signed a one-year extension with Piráti Chomutov (Czech Republic, Extraliga). This season, he had 19 goals and eight assists in 52 games. . . .
D Juraj Valach (Tri-City, Vancouver, Regina, Red Deer, 2006-08 has signed a one-year extension with Piráti Chomutov (Czech Republic, Extraliga). This season, he had five goals and 13 assists in 51 games. . . .
F Tyler Mosienko (Kelowna, 2000-05) has signed a one-year contract with Epinal (France, Ligue Magnus). This season, with the Sheffield Steelers (England, UK Elite), he had a goal and four assists in six games, and he had three goals and 11 assists in 32 games with Frederikshavn (Denmark, Metal Ligaen). . . .
F Konstantin Pushkaryov (Calgary, 2004-05) has signed a one-year two-way extension with Barys Astana (Kazakhstan, KHL). This season, he had three goals and nine assists in 32 games. . . .
F Dylan Walchuk (Spokane, 2011-13) has signed a one-year contract with Odense (Denmark, Metal Ligaen). This season, he had eight goals and 14 assists in 28 games with the University of Calgary (CIS). . . .
D Nick Walters (Everett, Brandon, Lethbridge, 2010-15) has signed a one-year contract with Odense (Denmark, Metal Ligaen). This season, he had a goal and three assists in 34 games with the Rapid City Rush (ECHL). The host Windsor Spitfires exploded for three goals in a record-tying 38 seconds and went on to beat the WHL-champion Seattle Thunderbirds, 7-1, at the Memorial Cup on Sunday. . . . The Spitfires improved to 2-0 in the four-team competition, with the Thunderbirds slipping to 0-2. . . . The victory assures the Spitfires of at least a spot in the tournament’s semifinal game. . . . The Thunderbirds were done in by horrid puck management. They were in possession of the puck in their zone on each of the first three goals, only to turn it over. Only on the play that led to the first goal was Windsor’s forecheck a real factor. . . . The Spitfires tied a tournament record for fastest three goals. They now share that record with the New Westminster Bruins, who did it in 1978 against the Trois-Rivieres Draveurs. . . . The Bruins got second-period goals from F Scott McLeod (6:03), F Ken Barry (6:21) and McLeod again (6:41) en route to a 6-3 victory on May 11, 1978 in Sudbury, Ont. The Bruins actually scored four times in 52 seconds. . . .
On Sunday, Windsor scored those three goals on six shots, sending Seattle G Carl Stankowski to the bench in the process. Stankowski had played through all 20 of his club’s WHL playoff games without being hooked. . . . When Stankowski left, G Rylan Toth, 21, who last played on March 11, entered the game. He left that March 11 game following the first period with an undisclosed injury and hadn’t even dressed for a game until Saturday when he was on the bench as Seattle lost 4-2 to the OHL-champion Erie Otters. . . .
F Graham Knott got Windsor’s first goal, at 4:48 of the first period. . . . F Julius Nattinen made it 2-0 just 21 seconds later. . . . F Logan Brown upped the lead to 3-0 at 5:26. . . . At that point, Seattle was being outshot, 6-0. . . . The Thunderbirds got on the scoreboard at 13:34 of the second period on a goal from F Keegan Kolesar. . . . Windsor responded with the game’s last four goals. . . . Nattinen, on a PP, restored the three-goal lead, at 18:24. . . . Knott, on another PP, added his second of the game, 33 seconds into the third period. . . . F Jeremiah Addison made it 6-1 at 3:48. He’s got two goals in the tournament. . . . Windsor F Jeremy Bracco completed the scoring with his second goal of the tournament, at 13:07. . . . Knott added an assist to his pair of goals, while Bracco had two helpers. . . .
G Michael DePietro blocked 24 shots for Windsor. . . . Stankowski gave up three goals on six shots, with Toth surrendering four on 22. . . . Windsor was 2-6 on the PP; Seattle was 0-4. . . . Announced attendance: 5,237. The facility holds 6,500. . . . OHL teams now have won 11 straight Memorial Cup games. The last time an OHL team lost in the tournament was in the 2014 final when the WHL’s Edmonton Oil Kings beat the Guelph Storm, 6-3. . . . On Monday, Erie (1-0) meets the QMJHL-champion Saint John Sea Dogs (0-1), at 4 p.m. PT (7 p.m. ET). . . . The Thunderbirds (0-2) are scheduled to play the Sea Dogs on Tuesday. Tim Pigulski of 710 ESPN Seattle had a piece right here on the goaltending decision facing Thunderbirds head coach Steve Konowalchuk before Tuesday . . . If you click right here, Tbird Tidbits explains the situation in which the Thunderbirds now find themselves. Terry Koshan of the Toronto Sun has a game story right here in which he points out that the Thunderbirds have played 94 games this season and this was the worst loss they have suffered. CHL fun fact: All of the American cities in the WHL are north of Windsor.